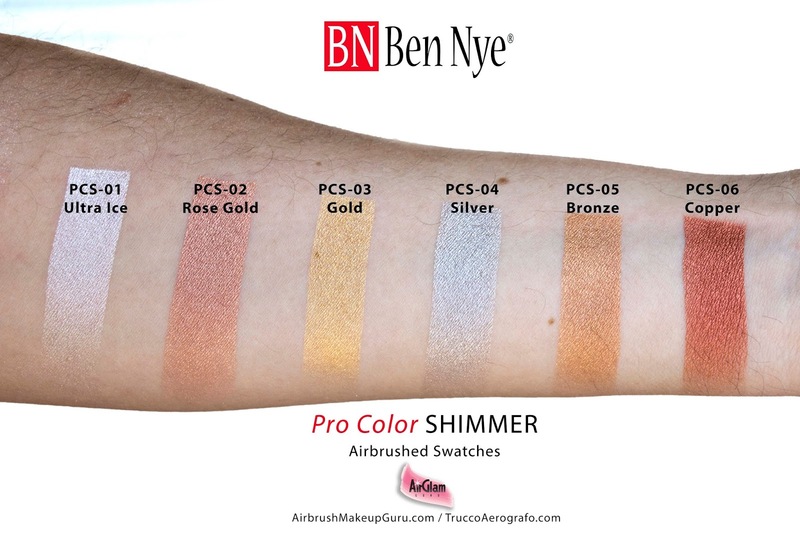 The Airbrush Makeup Guru: Ben Nye ProColor Airbrush Makeup Review and Video Tutorial! 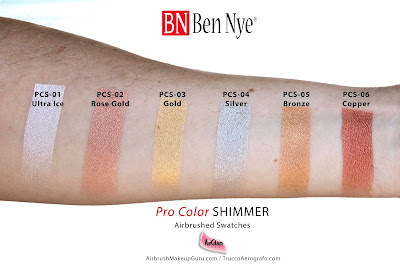 Ben Nye ProColor Airbrush Makeup Review and Video Tutorial! 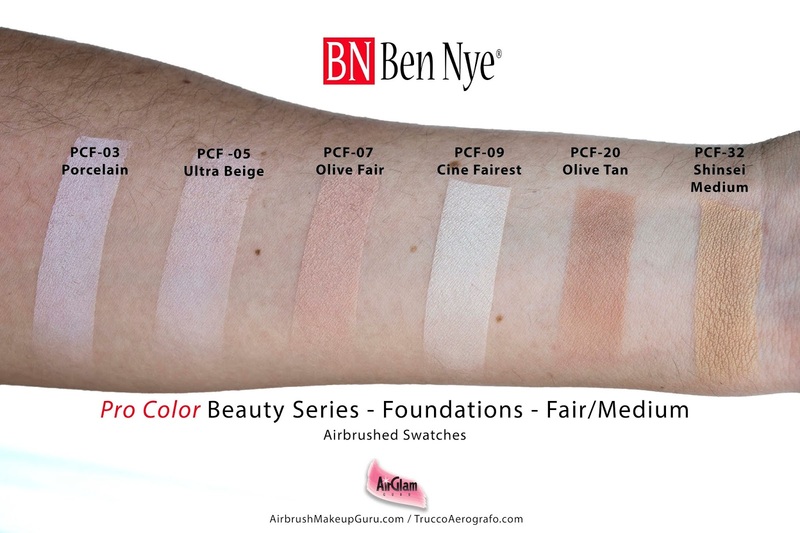 Founded by legendary makeup artist Ben Nye upon his retirement from the film industry, the Ben Nye Makeup Company is one of the most widely recognized brands of professional makeup in the United States and across the western hemisphere. 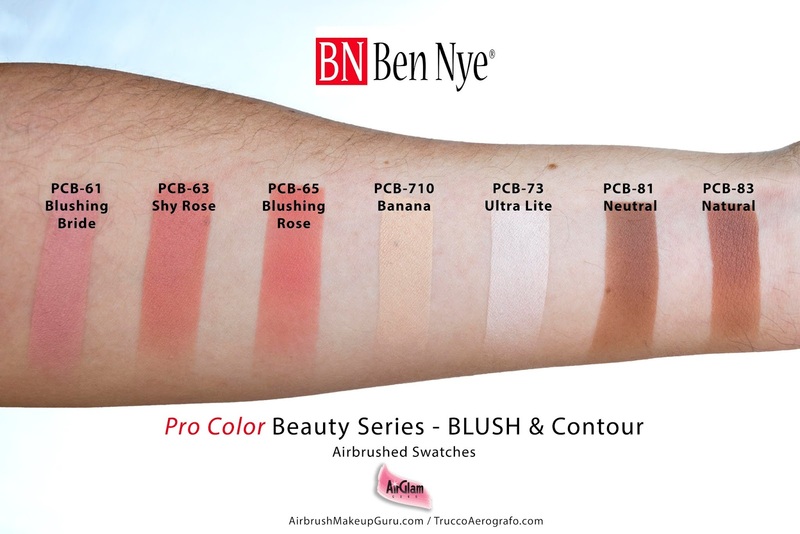 While several products from the extensive catalog of this brand were always usable in an airbrush, I was very happy to find out that about two years ago Ben Nye finally released a whole range of products that were designed specifically for this medium, called ProColor. The line is divided in six main groups totaling almost a staggering 100 different colors, and making this range one of the most complete in the airbrush makeup sector. Completing the line are a Mixing liquid and the classic Final Seal finishing formula repackaged in an airbrush ready format. All the Pro color shades are available in 1 fl. oz (29ml) or 2 fl. oz. (58 ml) bottles. There are also some intro kits of smaller .33 fl. oz. (10 ml) bottles for some of the groups of colors such as foundations and shimmers, and bigger kits of six larger 1 fl oz (29ml) pre selected colors for practicality and convenience. As Ben Nye does not sell directly through its website, you can search online for a trusted authorized distributors that stocks these products. I would describe the formula of the ProColor line as mainly water and polymer based, with the addition of only one type of silicone (Cyclomethicone) that serves as medium and evaporates quickly after application. The product has a low viscosity and a light texture, allowing for a very subtle application of buildable, sheer layers in the case of the foundation colors. 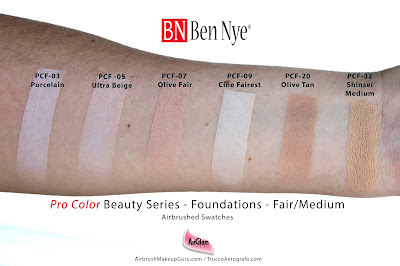 Colors from the FX and Classic lines are of course much more pigmented, but still very easy to apply without looking heavy in the case of a beauty makeup. The ideal airbrush nozzle size for these colors is a medium .35 or .40 while the best pressure setting for beauty makeup with this product is of course very low, approximately between 3 and 10 psi depending on the area you are covering. The formula does not contain any fragrance, and right out of the bottle has a scent that I would compare to that of cookie dough. Some may love it, others may like it less, but it will dissipate within seconds from the application anyhow. The finish of the foundation is matte, and the texture overall is very light and natural, offering medium coverage that can be increased with more sheer passes. The foundation formula used by itself has an average resistance to water, rubbing and perspiration consistent with that of most water based airbrush products. All these aspects I just mentioned can be significantly improved with the addition of Final Seal. This product is one of many Ben Nye staples in the makeup industry, and it is basically an alcohol based sealer that smells gorgeous and works wonderfully. Added to the makeup directly in the airbrush cup with a 1 to 1 or 2 drop ratio it will significantly increase its durability, but also render the texture even smoother and add a beautiful intrinsic luminosity to the finish (that can easily be matted down again if so desired with a light pass of Ben Nye Neutral Set or your preferred HD powder). The Final Seal fragrance will also neutralize the formula's initial scent making it the application even more pleasant. I would definitely recommend adding Final Seal both for special occasions and for warmer climates, and I would most definitely advise it for eyeshadow or eye area application, where it will render the makeup crease free and more durable. This will be especially useful if you are going to use the beautiful shimmer colors on the eyes, as their formula tends to crack easily on the eyelids if applied on its own. You need not worry about the alcohol content around the eyes as Final Seal is very gentle and of course you would apply it while the client's eyes are closed. 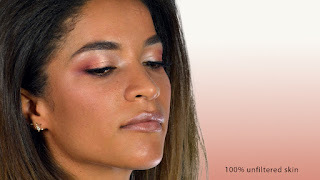 You can see several colors from the Beauty and Shimmer groups in action in enclosed video tutorial. As always I wanted to show as much of the line as possible in one single tutorial, so I went for a full beauty look using just ProColor shades. It was great to see how well the colors worked on the darker skin of our beautiful model. I only applied a light layer of Banana contour (it was great to find out that the legendary Banana Powder now exists in liquid form! 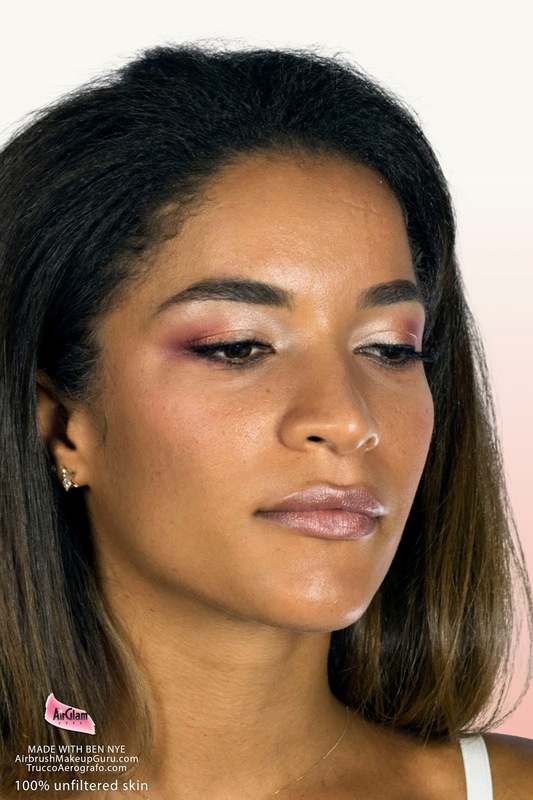 ), and the colors I chose for the eyes looked amazing with just minimal layering, with no need for a thick concealer base underneath as you would probably have to apply if you were dealing with traditional makeup. The foundation looked beautiful and extremely natural, especially out of the studio in natural light. This allowed me to post these photos with no added filters whatsoever.